In Space where the stars shine exist planets, and some smaller spheres that rotate around those planets. These spheres are called satellites. The protagonist of this story is a satellite that rotates around planet Earth, and is called “The Moon”. The moon is a big sphere, that used to be very arrogant and vain. She thought that she was the only moon in the universe, and she always thought: “I am the best! The only one chosen by the universe to exist!”. She had never seen anything or anyone. She never talked to anyone because when she was awake she only saw a dark universe, and when she was asleep she couldn’t see the live universe. One day, a little bird flew far from Earth up to the moon while she was asleep. 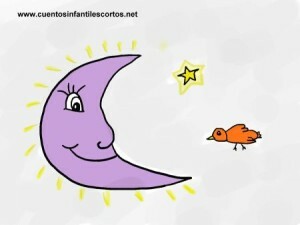 The moon woke up from the noise of the bird´s wings and got really angry. – “Alone? take a look around you and see the rest of the universe.”- said the bird. The moon realised that she was only a small satellite in a universe full of stars, planets and living beings. She never thought again that she was the only one that had been chosen by the universe, and understood that she had to be more modest and not think that she was the best. She was no longer arrogant and vain and instead became a happy and modest moon, with a big smile that children could only see it if they really wished to.